Skateboarding has come a long way since the late 1940s when skateboarders used improvised skateboards shaped out of wooden boards and boxes for performing daredevil tricks and stunts. Skateboards that evolved into longboards and shortboards held sway in the latter part of the 20th century till the first gasoline-powered skateboard made its appearance in 1975. Riding the motorized skateboard powered by gasoline was fraught with risks and it paved the way for the development an electric skateboard which first hit the market in the 90s. Electric skateboards that surfaced for the first time in mid 1970s started rising in popularity as gasoline driven skateboards were at risk of catching fire and exploding. Pioneering manufacturers of electric skateboards supported campaigns for developing the same by contributing and pooling in funds. Electric skateboards for sale are structurally similar to normal skateboards-they’ve a board balanced on four wheels. The difference lies in the mode of operation; skateboarders use their bodyweight for steering the standard skateboard whereas an electric skateboard comes with a motor and is mechanically steered using a remote. Though nothing can compare with the widespread popularity of traditional skateboards when it comes to skateboarding, electric skateboards are being extensively used by a certain section of individuals, especially urban commuters and college students. Riding and steering an electric skateboard is entertaining as you can cruise at speeds of up to 25 mph without having to make any physical effort. The electric skateboard not only serves as an effective alternative mode of transport helping you to reach your destination in time during a bottleneck but also lets you immerse yourself in action sports. Electric motor-Any electric skateboard would require a motor in order to be powered and driven. Talking about electric skateboard parts, the electric motor is the most indispensable component without which the skateboard is functionless. There are some models that have a distinct motor on each pair of wheels. Remote control-A remote control is usually supplied with the electric skateboard for monitoring the motor in order to accomplish specific and necessary functions like increasing or lowering speed or changing the direction. Many models come equipped with motors that can be remote controlled via your smartphone. Range-Range of an electric skateboard may be defined as the mileage that you get on a fully recharged battery. Some models offer you a mileage of 5 miles while some topnotch models will let you cover up to a maximum of 25-30 miles on a single charge. Construction-The more hardwearing an electric skateboard is the longer will be its shelf-life. The quality and attributes of materials used for crafting the skateboard determine its durability. The robustness of the wheels and brakes as well as the capacity of the batteries also affects build quality. Performance-No matter whichever model of skateboard you purchase, you’d expect it to at least let you skate smoothly on a sidewalk or glide smoothly down the street. A mechanized skateboard is exclusively designed to perform without your having to apply any effort and it is the efficiency of its electric motor that impacts performance. Waterproof-It is extremely crucial to protect the motor from the elements as well as prevent water or moisture from settling in the electric skateboard parts. Almost all electric skateboard builders ensure that the electric skateboard parts or components are fabricated from materials that are highly water resistant. LED lights-Premium quality electric skateboards are invariably fitted with LED lights that help skateboarders to see their way at nighttime or in darkness. Performance-An electric skateboard will be regarded as performance-oriented if it can accelerate, allows you to cover a good distance at top speed, charges quickly and lets you ascend a precipitous path (gradient). Other factors impinging on performance is the motorized system (hub or belt-driven), number of motors, wattage, and battery type. Construction (Build Quality)-Materials generally used for crafting skateboard decks are Maplewood, fiberglass, carbon, and bamboo along with composites or hybrid materials. Wooden decks enable you to steer smoothly when skating at low speeds while skateboards constructed from carbon composites offers you good poise when riding at a high speed. Convenience of use-Management of the skateboard is largely dependent on its build quality. Portability-The smaller the dimensions and lesser the weight of the skateboard, the more portable will it be. Maintenance-A quality electric skateboard should be easy to maintain or in other words you should be able to clean the deck along with the components effortlessly. Worn out parts should also be easily replaceable. Hone your skateboarding skills with the SWAGTRON SwagBoard NG-1 Electric Motorized Skateboard with Wireless LED Remote. 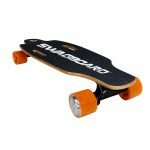 One of the most versatile electric skateboards under $200, the deck of this longboard from Swagtron has been chiseled out of 7-ply Canadian Maplewood making it extraordinarily hardwearing. The wheel pairs shaped out of high grade of polyurethane not only allow you to coast at speeds of up to 11mph on any terrain without compromising on steadiness. The UL2272 certified 24V Li-On Fe battery reinforced with proprietary SentryShield technology fully charges up within 3 hrs which lasts for a 10-mile ride. Enveloped with grip tape for transferring greater resistance to your feet, the skateboard is eminently portable and can support a bodyweight of up to 176lbs. Skateboarding becomes a breeze and immensely entertaining with the Yuneec E-GO2 Electric Longboard Skateboard. 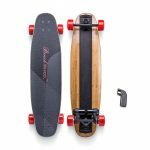 This is an electric skateboard that has an aerodynamic form factor enabling you to have an enhanced grip while riding straight or changing course. At the same time, the ergonomic kicktail design also comes in handy when you to wish to coast up speed or glide at a leisurely pace. Upwardly curved tip at the front while the flat profile of the tail end helps to maneuver the skateboard more efficiently. You can go as far as up to 18 miles with a single charge of the battery and expect to skate at a maximum speed of 12.5mph. The sturdy deck and the large 90mm wheels work in perfect unison for a smooth ride to office or skating back to home. The Boosted Dual+ 2000W is surely one of the top 5 electric skateboards that you can buy. The 38-inch long skateboard deck chipped out of the best grade of bamboo tapers on both ends enabling you to cruise on city roads as well as on off-road and hilly tracks. Grip tape covering helps to keep feet firmly in place regardless of whether you’re going uphill or zigzagging downhill. Boosted Dual electric skateboard drive wheel has been shaped out of polyurethane which makes it hardwearing and a 75mm width enables firm grip during rides. The 2000W motor transfers enough power to the Boosted Dual to make it cruise at speeds of 22mph. 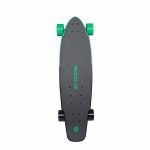 The Benchwheel Dual is one of the most versatile electric skateboards 2018 that you can own for honing your skateboarding skills. This mechanical skateboard comes equipped with a heavyweight 1800W motor that makes it effective for coasting a speed of 18.6mph. Twin brushless motors contribute towards accelerating the torque thereby letting you accomplish sharp turns and twists or deftly bypass an incoming vehicle. The deck of the Benchwheel Dual made out from a blend of bamboo and fiber glass makes it flexible, durable, and lightweight enabling you to cover 12.4 miles without sacrificing toehold. The wheels made out of toughened PU add to the effectiveness of this electric skateboard. Lite is one of the most multipurpose electric skateboards under $300 that can be comfortably paired up with your smartphone for unlocking the features of the ACTON app through Bluetooth. Once paired, you’ll be able to keep track of the miles logged, check remaining battery charge, archive the routes, and alter riding modes. 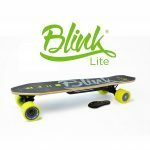 The newly launched version of Blink Lite from Acton has a fishtail styled deck which lets you skate with speed without having to sacrifice steadiness. The hub motor embedded in between the wheels comes in supremely handy when you need to accelerate or ride smoothly and also when you need to brake instantly. Though electric skateboards 2018 cannot compete with the leeway and leverage provided by traditional skateboards, they’re still good enough for skateboarding on boardwalks, college campuses, and hilly tracks. 5 electric skateboards of reputed manufacturers were taken up for review. Of these, the Boosted Dual+ was found to be perfectly suitable for professional skateboarding as one could coast speeds of up to 22mph. Also, it was the most expensive of all the reviewed models. Yuneec E-Go2 and Benchwheel Dual were also found to be suitable for skateboarding at a moderate level. Swagtron and ACTON skateboards were ideal for those who were looking for an entry-level model.